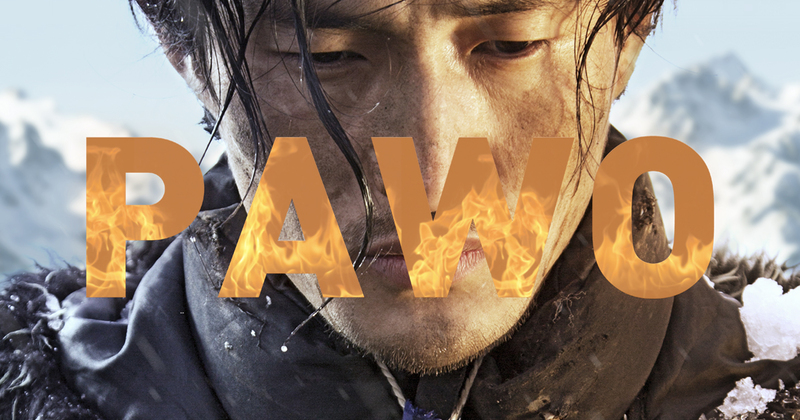 “Pawo” is not a film about self-immolations, it is much more a film about one’s own homeland and its loss. The work of German director Marvin Litwak and Tibetan filmmaker Sonam Tseten, the film documents the life of a young Tibetan, who, following his flight over the Himalayas, seeks one last refuge and his life’s purpose. Dorjee, played by Shavo Dorjee, lives with his younger sisters, Chesa and Gonpo, in a remote village in today’s Tibet. Due to his elder brother’s failings, the reserved young man has to take care of his family. In the first half, the plot jumps back and forth between Dorjee’s childhood years and his later life – at that point on the threshold of adulthood; Dorjee is at once the protagonist as well as the narrator of the story. In the second half of the film, we find ourselves in the narrow streets of Manju-ka-tilla, a Tibetan settlement founded in the 1960s in New Delhi. Dorjee, who is accustomed to the vastness of Tibet, does not feel at home in the dirty environment there. Plans to build a secure existence in exile do not interest the torn young man. Only a diverting and innocent love story gives the film a few joyful moments. But this ultimately also fails because of Dorjee’s deep attachment to his homeland, which he is not ready to give up. “Pawo” is a slow and soulfully staged work with a strong and authentic protagonist that tells the story of Jamphel Yeshi – a young Tibetan who set himself on fire on 26 March, 2012, in protest against Chinese rule in Tibet. By focusing on Dorjee’s perspective and feelings, the political and historical dimensions of the subject matter are given little space. The challenges of everyday life in Tibet are hinted at; the narrative jumps between school, protest, flight and exile, which build an accurate picture of the real situation. It’s possible that “Pawo” does not claim to present an accurate portrait of the social conditions. After all, the film tells the story of Dorjee from his own personal point of view. The film is interested in the micro level, and works quite well in this regard. Regarding the overall context of the material, a lot can be made out of what is shown in this sensitively presented work. “Pawo” does not attempt to raise new issues or to launch a discussion but it is keen to capture the emotions of Jamphel Yeshi on a personal level. Only at the point where Dorjee talks to his cousin and other roommates about the ongoing self-immolations in Tibet, while different opinions come to light, the film seems somewhat artificial in its discourse. Though the usual positions are represented, the dialogue (for a Tibetan audience) seems a bit bumpy. On the whole, “Pawo” takes a more critical view of our exile – a place that we usually associate with freedom and independence. Despite its Tibetan environment, Manju-ka-tilla is never home for Dorjee, but always foreign. His existence in this unknown and incomprehensible place has no meaning for him. It is not what his father once fought so hard and relentlessly for. By using high-contrast and wide-format images for the wide streets of Tibet and the narrow alleys and spaces of Manju-ka-tilla, the film makes these differences very clear. In particular, the film succeeds impressively in one aspect: in mostly darkly lit scenes, we experience both the physical and mental journey of Pawo Jamphel Yeshi, the trenches in his soul ripping, which will eventually break him.